Breakups are painful. They effect us emotionally. But happens, it is life. We have to face such disaster and move in life. Every thing have a hidden lesson for us. Breakup is not a exception. Here I am sharing some lessons you learn after a breakup. 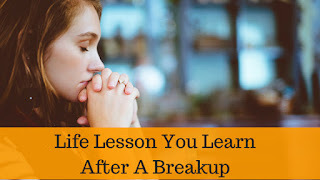 The first thing a breakup teach you that nothing is permanent. Things changes, people move on. Change is the universal truth. Good time converts in bad time and bad time in good one. Focus on your career and health. Your health is more important than anyone. If you are healthy and fit, you will find some better. There is none to take care of you if you fall ill. Chase your life goals. Believe in your self. Concentrate on your health and career. Someone better is waiting for you. Prepare yourself for him/her. Go for shopping and have a new haircut. Improve your skills and look. You are lucky, you have wonderful friends. Spend your time with friends. Go for a trip with your friends. Now you are free, enjoy your freedom with friends. Share your things with them. Now you understand what is sadness, how people feel when someone cheat them. You are a better version of yourself now.